What one thing could possibly destroy the entire Star Wars saga? 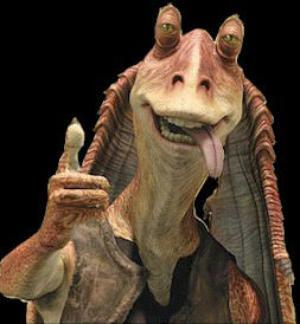 Not Jar Jar Binks. Not Anakin Skywalker as a little kid or a whiny teenager. Not Darth Vader yelling “NOOOOOOO!” Not even Yoda jumping around with a little green lightsaber. No, my fellow Star Wars fans. There is something much worse – a place George Lucas would never dare go in his worst nightmares. Earth. Yes, the Earth would destroy Star Wars forever. Specifically, bringing any of the Star Wars characters to Earth. 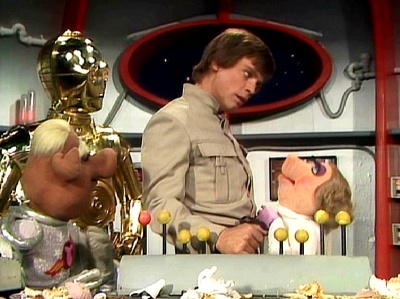 I’m not talking about Yoda’s cameo in E.T., nor am I referring to the episode of The Muppet Show featuring Luke Skywalker, C-3PO, and Chewbacca (and Yoda doing the voice of Miss Piggy). All of that was just for fun. But if there was an official movie in which a Star Destroyer showed up in orbit around the Earth, or the Rebellion established a secret base on our planet, that would forever alter and ruin the Star Wars universe that Lucas created. I’ll discuss five reasons for making such an audacious claim. Each Star Wars film begins by telling us the events we’re about to watch took place “A Long Time Ago in a Galaxy Far, Far Away…” This vagueness about the time and location of the events in these films is part of what makes them fairy tales, not science fiction. They have no relation to us. We have nothing to gain or lose through the Rebels’ victory or destruction. It’s similar to the inhabitants of Middle Earth in The Lord of the Rings. However, if at any time the setting shifted to our world, Star Wars would cease to be a fairy tale. Think about it. What stage was our civilization at when Star Wars took place? Was it when the Roman Empire was in power? Or the Pharaohs? Or the dinosaurs? What did Lucas mean when he said the events happened “a long time ago”? The answer is: We don’t need to know. In fact, it’s better if we don’t. Star Wars is nothing like Independence Day, Battle: Los Angeles or any other alien invasion movie. It’s the story of groups of alien beings who are used to being around other aliens, so bizarre creatures are commonplace to them. There’s nothing inherently threatening about an alien visiting another world. For example, in Return of the Jedi, two alien forces come to the Forest Moon of Endor to wage an epic battle that doesn’t really affect the Ewoks. I mean, the Ewoks might be indirectly affected by the winner, but no more so than the creatures on Hoth, Dagobah or any of the other worlds that haven’t achieved space travel. 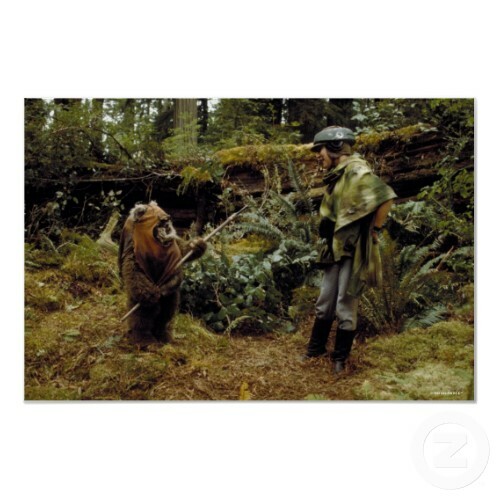 The Ewoks don’t flee in terror from the alien intruders they encounter in their forest. They actually welcome some of them as friends and invite them to join their tribe! Can you imagine the people of Earth being so inviting to aliens? I don’t think so. By the way, apparently having a moon-sized Death Star built in orbit around their planet wasn’t enough to alter Endor’s rotation, plate tectonics or anything like that. Thank goodness for that. 3. Luke Skywalker Is an Alien? There’s a line in The Empire Strikes Back that has always stuck with me. It’s nothing too dramatic; a throwaway line, really. When Han Solo and Luke are trapped outside the Rebel Base on Hoth during a brutal snowstorm, C3PO comforts R2D2 by telling him a little about Luke, “He’s quite clever you know – for a human being.” The problem with that statement is that Luke isn’t human in the traditional sense of the word: a member of the homo sapiens race. If creatures managed to “evolve” on other worlds into beings that look, sound, and act just like human beings from Earth, would we still call them humans? Or would we call them aliens because they come from other planets? As far as I know, Superman never claims to be human. He looks like one, but he’s really Kryptonian. 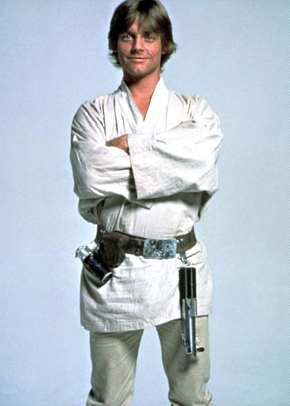 Is Luke (or Han Solo or Princess Leia, for that matter) any different? The great thing about Star Wars is that this question doesn’t matter. The characters are so far removed from Earth that we don’t have to worry about who they are in relation to us. We’re free to see ourselves in Luke’s shoes and to imagine ourselves fighting alongside him against the evil Empire because we see so much of the human spirit in him. There are some things that Star Trek can do that Star Wars simply can’t. Going to Earth is one. That’s because Star Trek explicitly states that it’s the story of a group of people mostly from Earth in the distant future who explore the universe. If they want to return to Earth, they are welcome to, and the audience doesn’t mind because we accept that that is their point of origin. None of the Star Wars characters are from Earth. They don’t belong here. If they came here, it would have to be in pursuit of refuge, war or something else to benefit them. That makes Earth seem insignificant and like just another planet for the characters to visit at their convenience. But Earth shouldn’t mean anything or be at all special to the characters in Star Wars. We might have natural resources that other planets don’t possess, but we wouldn’t be useful allies since we’re not even close to being a threat in space. It’s best to just leave Earth out of the equation entirely. In Star Wars, ambiguity is better than specificity. Wasn’t the Force so much more interesting and mystical before Qui-Gon Jinn started telling Anakin about Midi-chlorians in The Phantom Menace? Also, I thought it was touching to think of Leia’s mother caring for her as a young child and possibly having to leave for some tragic reason when Leia described her feelings for her mother in Return of the Jedi. But when I learned that Padme Amidala died right after giving birth and then Luke and Leia were immediately sent off to separate planets, to say I was disappointed would be a colossal understatement. The truth is, I didn’t need to know the specifics of how the Force works to believe in it, or to know Darth Vader’s backstory to enjoy him as a villain. The same thing applies to Earth’s place in the Star Wars universe. It doesn’t need one. I think I remember hearing Steven Spielberg say, around the time E.T. The Extra Terrestrial came out, that his friend George Lucas is the master of aliens when they’re in deep space, but Spielberg is the master of aliens when they come to Earth. That certainly showed in their respective work on Close Encounters of the Third Kind, Star Wars, and other classic films. George Lucas should have stayed away from projects involving aliens coming to Earth, like Howard the Duck (which he only executive produced, I know) and Indiana Jones and the Kingdom of the Crystal Skull. He’s just no good at them. I am so glad he resisted any temptation he might have had to bring his Star Wars characters to Earth in a feature film. He can merchandise the heck out of them here on Earth and not put a dent in their credibility because they’re still safe in a galaxy far, far away. That’s one thing I will always be grateful to Lucas for. Well done, sir. All photos from the Star Wars films are the copyright of Lucasfilm Ltd. This entry was posted in Random Stuff and tagged alien, anakin skywalker, darth vader, death star, empire strikes back, et the extra terrestrial, fairy tales, films, george lucas, han solo, lord of the rings, luke skywalker, movie review, movies, muppets, padme amidala, phantom menace, return of the jedi, science fiction, star trek, star wars, star wars prequels, steven spielberg, superman, yoda. Bookmark the permalink. Hey Rob. It’s Mike. Actually, Star Wars did meet Earth in a TV show that I think was called “Ewoks” that came out shortly after Return of the Jedi. In that show, kids from Earth were transported to Endor and lived with the Ewoks. It was terrible, and very confusing for all of the reasons you mentioned in this article. Other examples of Sci-Fi stories being ruined by their arrival at Earth are both versions of Battlestar Gallactica. The original 1970s TV series was followed by a movie in which the Battlestar Gallactica arrived at modern Earth and the characters fought Cylons in barns and other rural locations. The more recent SyFy channel series ended in stone age Earth with people from an advanced culture choosing to abandon technology to live as cave men. Not only was this implausible, but their arrival on Earth made me wonder why these people worshipped Greek gods that would be worshipped again thousands of years later by the Greeks, why they spoke English, and dressed similarly to modern humans on Earth. As long as their world was separate from ours, I could accept these things, but their arrival made all of that feel pretty akward. Thanks, Mike. I had completely forgotten what the plot was of the Battle for Endor and whatever the other one was called. Hopefully George Lucas learned his lesson from those lackluster spinoffs. I mean, we loved Star Wars as kids and I remember seeing those Ewok movies, but they just didn’t leave any impression on me. I also remember seeing Conquest of the Earth, but I can’t remember the plot of that one at all, either. That’s too bad that the makers of the new Battlestar Galactica ended the show so badly. Sheesh. If a movie or TV show is going to mess with the past, it should at least have the decency to make up an alternate universe or something that I can actually take seriously.